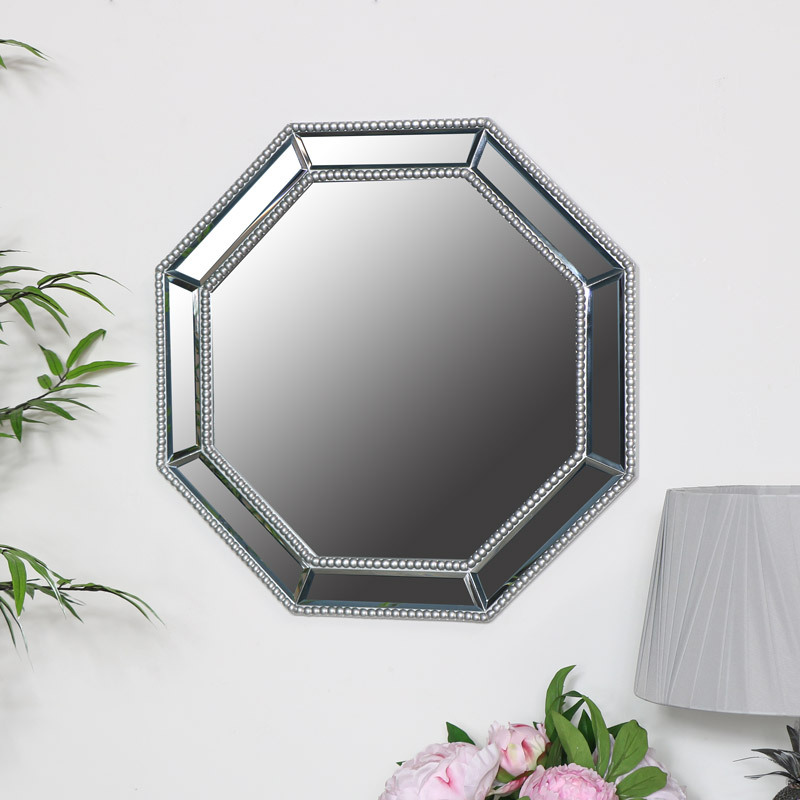 Ornate silver octagonal beaded wall mirror. Geometric insipred design for displaying in a modern, contemporary or traditional style living room or hallway. Beautifully designed with bevelled mirrored panels in an ocatagon shaped silver frame surrounding the centre mirror. The finishing touch for any home and a great gift idea for friends or family. Ornate silver octagonal beaded wall mirror. Geometric insipred design for displaying in a modern, contemporary or traditional style living room or hallway. Beautifully designed with bevelled mirrored panels in an ocatagon shaped silver frame surrounding the centre mirror. The finishing touch for any home and a great gift idea for friends or family. Made with wood in a silver finish with resin beaded detailing. Easily wall mounted with 2 D-ring hooks on the back. If you're looking for even bigger or smaller, we have many mirrors to choose from in a fantastic range of sizes, designs and shapes.